“I need you to understand how serious this surgery is going be. This is more serious than a heart transplant, and to be honest most babies are in a far better place entering into this surgery than your son.” The anesthesiologist told my husband and me these words as he placed the consent form for surgery into my hand. My son Daniel was five days old and was scheduled to receive open heart surgery the following day. Although Daniel required a ventilator to breath and he was experiencing metabolic acidosis because his struggling heart fought to maintain life, I felt very blessed that Daniel was in a pediatric intensive care unit designated solely for cardiac patients. See, my son was born with Congenital Heart Disease (CHD). CHD occurs when a child’s heart does not form correctly in the womb. Structurally, the child’s heart is different. CHD is the number one cause of defects in newborns and the leading cause of death in infants under the age of one. I was introduced to CHD during an ultrasound when I was 18 weeks pregnant. Due to complications I experienced with the birth of my first son, my OB decided it best to send me to a specialist for my ultrasound. During the ultrasound, the technician saw something amiss with Daniel’s heart that led to a referral to a pediatric cardiologist, which in turn gave us a formal diagnosis: Transposition of the Great Arteries, Coarctation of the Aorta, Ventricular Septal Defect (VSD) and Atrial Septal Defect (ASD). When Daniel’s heart was forming, the aorta and pulmonary artery attached to the wrong chamber, which is called Transposition of the Great Arteries. This defect creates a circulatory system that does not deliver oxygenated blood to the organ systems. Coarctation means that his aorta was too narrow to function properly, while a VSD and ASD are holes found in the upper and lower chambers of the heart. Four defects total and two critical defects, meaning that Daniel would require open heart surgery sometime after his birth in order to survive. To say that Daniel’s first open heart surgery was a monumental task is an understatement. Daniel spent over 14 hours in the operating room that day as a surgeon made the multiple repairs to his vulnerable, walnut-sized heart. What I failed to realize is that CHD is a life-long condition, and just like the Israelites who roamed the desert for 40 years after witnessing a great miracle, I landed in the wilderness of medical complexity. The wilderness consisted of Daniel suffering a stroke shortly after his first surgery, a diagnosis of hydrocephalus, placement of a G-tube, two heart catheterizations, durable home medical equipment, feeding therapy, occupational therapy, physical therapy, speech therapy, a second open heart surgery, brain surgery, and did I mention vomit? Yes, lots and lots of vomit because of a condition called gastroparesis. It is embarrassing to admit that I did not realize the long term consequences of CHD and the current interventions used to treat it, especially since I have a background in special education and have worked with many children over the years with a wide variety of diagnoses. The truth is that this is the first time in history when many children with complex CHDs are actually living into adulthood. With technology and enhanced surgical skills, 85 percent of children with complex CHD are able to live until adulthood, but will often experience many medical complications including developmental delays. Daniel, being feisty and fierce, is almost three years old. We continue to participate in therapy sessions three days a week, attend interminable doctor appointments, and actively participate in germ warfare, trying our best to keep Daniel healthy and out of the hospital. 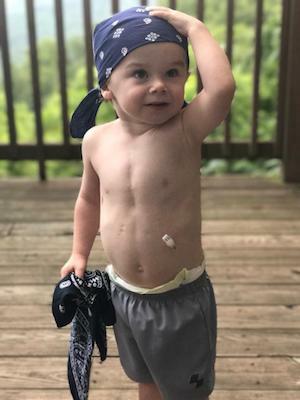 Due to Daniel’s heart defects, hydrocephalus, and GI issues, he will forever need specialized health care and we never know when we will hear the word “surgery” again. Please do not think I am complaining when I share Daniel’s story; I truly understand how blessed I am to be able to hold my little boy, and most days I try to live my life in overflowing gratitude of this blessing. But, the reality of CHD can at times be stressful, lonely, and overwhelming. Not knowing what lies ahead forces me to choose joy, because at the end of the day, joy is a choice and can even be found in a medical wilderness. Jennifer is the mother of two special kiddos, Eli who is eight and Daniel who is two years old, and wife to an incredible husband, Chris. Jennifer’s background is in special education where she has served as a classroom teacher, an educational specialist, and as an early interventionist. 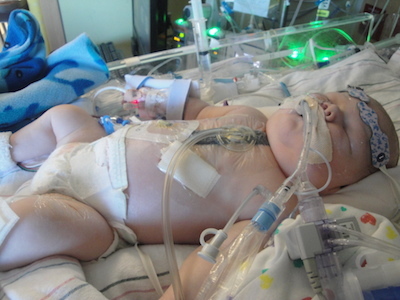 Daniel was born with congenital heart disease and due to various complications is considered to be medically complex. Jennifer now stays home to care for her two sons. The Barbers are Patient Family Ambassadors for Duke Children’s and enjoy sharing Daniel’s heart story at local events.